A facelift, or rhytidectomy, is a popular surgical procedure that recovers human skin appearance from visible signs of aging in the face. Due to aging human skin can encounter problems like sagging, deep creases, fat, loss of skin tone etc. On this kind of condition the only possible cure is facelift. 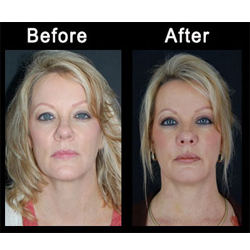 Today's face-lifts not only tighten skin but do more by repositioning muscle, skin, and fat. The best candidates for face-lift surgery are people who show some signs of facial aging but still have some skin elasticity. To perform this procedure, a facial plastic surgeon will lift and tighten the underlying muscles of the face to create more youthful contour and rejuvenate the facial structure. 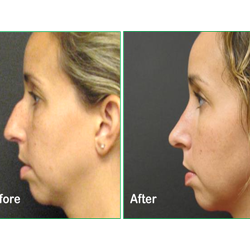 Rhinoplasty is a cosmetic plastic surgery procedure that reshapes, resize and transform the nose of human into a more sizable figure. It can change the angle of the nose in relation to the upper lip; help to relieve some breathing problems, narrow the opening of the nostrils, make the nose larger or smaller; alter the tip of the nose; or correct bumps, indentations, or other deficiencies in the nose. Eyelid surgery, or blepharoplasty, is a surgical procedure for improving the appearance of the eyelids. 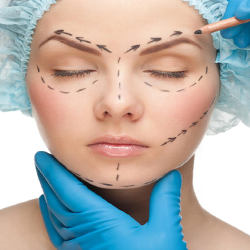 Here surgery is performed on either the upper and lower lids, or both. 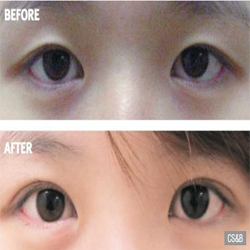 Eyelid surgery can make well Loose or sagging skin that creates folds or disturbs the natural contour of the upper eyelid, sometimes impairing vision, excess fatty deposits that appear as bump in the eyelids, bags appears under the eyes, drooping lower eyelids that reveal white below the iris, excess skin and fine wrinkles of the lower eyelid. Getting old usually affects our skin badly - particularly the mid-face and chin area - loses some volume, helping to draw the skin downwards. To get back the appearance of youth again one can transform the mid-face by transplanting fat taken from different part of the body especially from abdomen and thighs. This process is usually called facial fat grafting and it can make you look healthier by restoring the glow that growing years have taken away from you. Fat transfer can also help reduce the appearance of acne scars. Scars are visible signs that remain. Scars are inescapable for many people after a wound has healed after injury or surgery etc.. They remain as visible signs after surgery and poor healing may contribute to scars that are obvious, unpleasant or disfiguring. 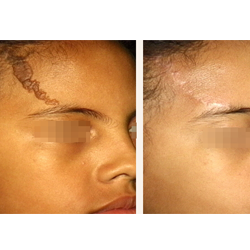 With scar revision procedure the scars can be removed completely and the new wound closed very carefully. There are various surgical techniques for scar revision is applied to make the scar as smooth and unseen as possible. The treatments include recreating the incision, moving skin around or even moving the scar to make it less visible. When people consider their ears to be too prominent it means there is some kind of deformation in their ears due to inheritance and birth. Most prominent ears cases lack a normal fold, and sometimes one ear is more prominent than the other. People with prominent ears face different psychological problems like teasing, joking etc due to their discrepancy. The medical surgery for prominent ears correction is called Pinnaplasty or Otoplasty which is an operation that adjusts the shape of the cartilage within the ear to create the missing folds and to allow the ear to lie closer to the side of the head. - All about your Hair Health. How to get a natural Hair? - Hair Loss facts. Is it normal ? Leave an Appointment & we will call you back.